From the directors of Little Miss Sunshine comes a “charming and delightful” (Marshall Fine, Huffingtonpost.com) romantic comedy starring Paul Dano and writer-actress Zoe Kazan. Struggling with writer’s block and a lackluster love life, once-famous novelist Calvin (Dano) creates a beautiful fictitious character named Ruby (Kazan) who inspires him. But not only does this bring his work to life- it also brings Ruby to life- literally! Face-to-face with an actual relationship with his once virtual girlfriend, Calvin must now decide whether to pen this love story or let it write itself. Also starring Annette Bening, Antonio Banderas and Elliott Gould, Ruby Sparks is a smart coming-of-age story that proves true love can be remarkably magical. When I first saw the trailer for this I didn't have high hopes for this. It seemed like maybe a B movie that I'd watch if it came on TV. So when I got the opportunity to review it I wanted to make sure that I focus on the movie and not completely dislike it because the trailer didn't impress me too much. Turns out, I like it. My husband found it more interesting than I did. I mean, to write and create a woman out of thin air, who wants that?!?! EVERY MAN ON THE PLANET is who! LOL....But even creating a woman doesn't mean she doesn't have flaws. This was very entertaining. I laughed and felt for both of the main characters. This is yet another movie that you have to have the taste for because not everyone will like it, but I'd give it a three out of five if I was rating it. Check out the trailer below, let me know what you think. Disclosure: All opinions are my own. 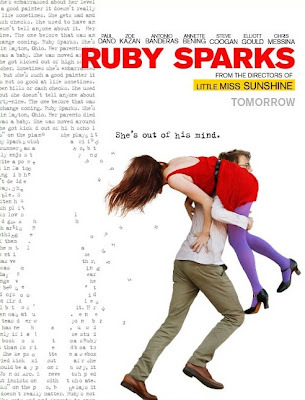 I received the Ruby Sparks at no cost for the purpose of this review. No other compensation was received.